November in the south of Australia means the arrival of long awaited peony blooms in florists and cool climate gardens. It is one of our favourite times of the year when peonies and roses are both in bloom! we are always on the hunt for beautiful open gardens and flower farms so when we came across a ‘pick your own’ peony farm we knew we had to visit. Located about 1 and a half hours from Melbourne in the tiny hamlet of Spring Hill, the Spring Hill Peony Farm opens its gates a few days each year in late November for guests to come and enjoy a day of picking peonies, picnicking and relaxing in the countryside. The peony farm is also home to the Little Church in Spring Hill, a quaint historic church that is beautiful for weddings and events. 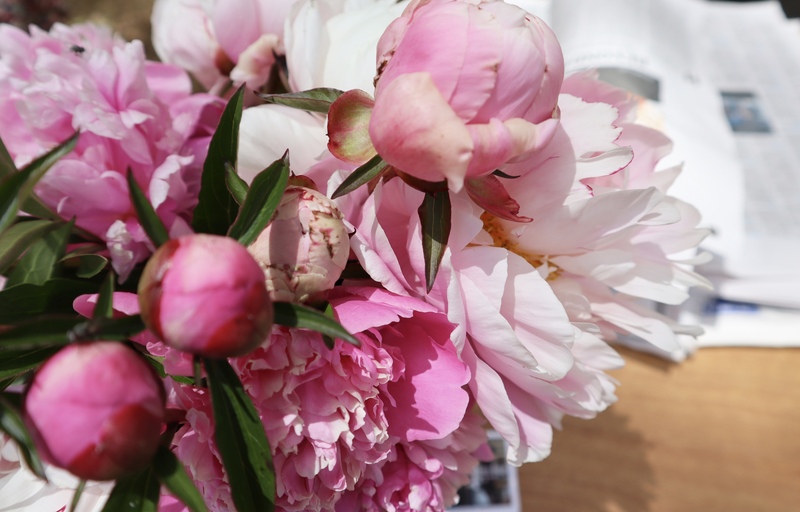 If you don’t plan to self-pick any blooms on the day you can attend to just wander the peony field, visit the church or buy pre-cut bunches and plants while enjoying the country air. Make sure you wear sensible footwear as the farm is a working farm and can be muddy after rain and there is always the possibility of snakes in the countryside this time of the year! Tickets to pick your own peonies sell out quick so make you keep an eye on the website and book in advance to make sure you get a ticket. For more information, including opening days, location and how to book tickets visit here. For more of these beautiful blooms visit here and here. Gorgeous peonies but you lost me at snakes! There was one spotted on the day we were there! You made my day with your beautiful peony photos and post. I’m sitting here in central Ontario, rain/freezing rain outside and knowing I won’t see a peony for another 6-6.5 months. Glad you enjoyed them. We have just come out of a cold winter and excited for the sunshine finally! Absolutely beautiful! In the Midwest part of the U.S., farm houses have peony hedges just like the farm rows in your pictures. Blessings!! Peonies are my favourite flowers. I have 65 plants in my garden at Casa Debbio and I am planning to plants lots more next year. I would be in heaven in this garden!